In 1767, portions of the South Carolina frontier were surveyed by a party of North Carolinians, led by none other than the North Carolina Governor himself, William Tryon. A year or two later, a substantial portion of the frontier of North Carolina was surveyed by James Cook, a South Carolinian, at the request of his government. Why couldn’t each province survey its own lands? South Carolina and North Carolina were arguing over the boundary throughout most of the 18th century. In 1735 and 1737, the boundary was run approximately 90 miles in a northwesterly line from the coast to a point believed to be at 35 degrees north latitude. In 1764, the line was resurveyed, with instructions to extend the line to the 35th parallel, if not already there, and then due west. The 1764 survey extended the line due west from the termination point of the 1737 North Carolina boundary survey, not realizing that the 1737 survey terminus, and hence their 1764 east-west line, was actually 11 miles south of the 35th parallel. The east-west line was run only as far as a point about 30 miles south of Charlotte. However, that region, the Waxhaws, was already becoming heavily settled, leading to great confusion on validity of land grants and the collection of taxes. The King instructed both provinces to refrain from any further land grants and settlements until a boundary could be determined. 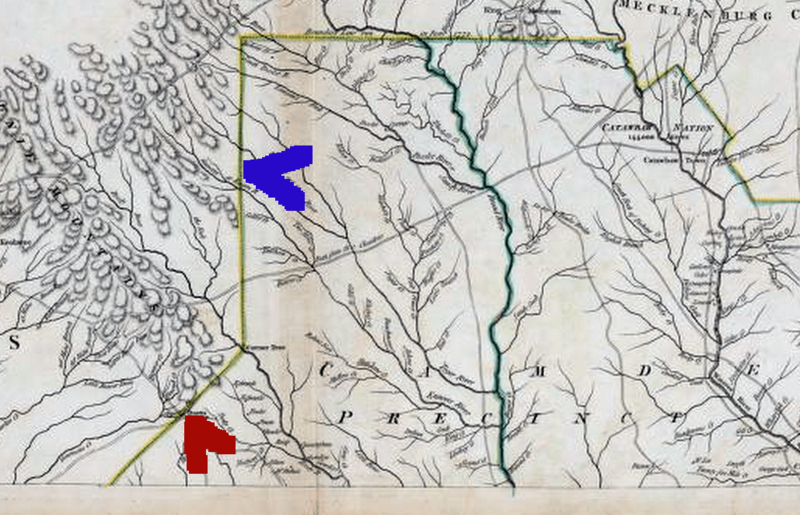 There was also confusion over the boundary between each province and the Cherokee nation, so South Carolina and the Cherokees surveyed a portion of that boundary. In order not to agitate Governor Tryon, they stopped well short of any potential western extension of the NC/SC boundary to insure that they would not encroach on NC territory. The following year, Governor Tryon personally led a survey party that continued the Cherokee boundary due north to Tryon Mountain. This former boundary now lies almost wholly within South Carolina. Governor Tryon had suggested, for simplicity, to continue the 1764 line due west. However, by 1768, South Carolina surveyor James Cook had found the error of latitude in the 1764 line, so South Carolina was in no way interested in losing even more territory by agreeing to Tryon’s proposal. Instead, South Carolina proposed using the Catawba River as the boundary to its headwaters, an encroachment on North Carolina that would be far more injurious than the loss of territory to SC by the erroneous 1764 line. James Cook was sent to survey that region of North Carolina. The manuscript map he submitted was incorporated in the proposal made by the South Carolina Governor and Council to the Board of Trade. The map is now preserved in the UK National Archives. Although a digital scan has been obtained, permission has not been granted to use the image on this web site. The topographic detail from that manuscript was incorporated into Cook’s 1773 map of South Carolina, and subsequently the 1775 Mouzon map. Detail from the 1773 Cook map of South Carolina, courtesy of the David Rumsey Collection. Montague Hills in North Carolina was named in honor of South Carolina Governor Charles Greville Montagu. An 1895 facsimile of Cook’s Catawba River region manuscript map was published in the Colonial Records of North Carolina, and is available on line thanks to the marvelous NC Map Project web site. The Board of Trade, with the King’s blessing, decided on a compromise boundary in 1771, subsequently surveyed in 1772, that accounts for the position of the current boundary from the terminus of the 1764 line to the Blue Ridge. The South Carolina Historical Society is currently sponsoring an exhibit on this topic, The Shaping of South Carolina: A Story of Adventure, Politics, and Boundary Making. This exhibit is open through February 2014, at the Native American Studies Center, 119 South Main Street, Lancaster, SC. Allan Jon Zupan from the South Carolina Geodetic Survey office will be speaking on the history of South Carolina boundaries and current boundary issues at the NASC on Thursday evening, October 3, 2013. Please contact the NASC or the SCHS for details. If you have a chance to visit the exhibit or attend the lecture, or if you have comments or questions, please let us know via the “Leave a Reply” option below. 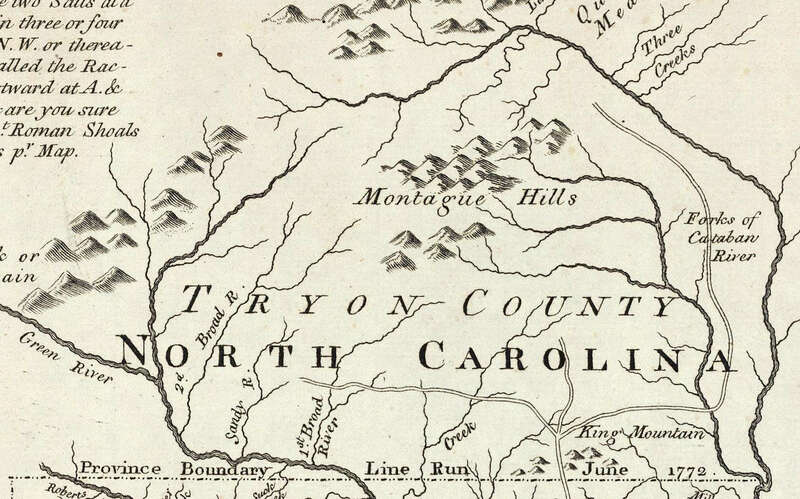 This entry was posted in 18th Century, Boundaries and tagged charles greville montagu, James Cook, north carolina boundary, william tryon by crmaps. Bookmark the permalink. I have heard that the lecture (mentioned above) on Thursday evening, Oct 3, may be videorecorded. If it is made available on line in the future, a link will be added to the blog post. please post this lecture soon.